The UK has produced a number of top male chefs who have gone on to host TV shows, open restaurant chains and try to change the way we eat. Here are just a few of them. Jamie Oliver was a relative youngster when he became famous. He was born in 1975 and first worked as a pastry chef at Antonio Carluccio’s Neal Street restaurant, although he had spent time working in the kitchen of his parents’ pub as he was growing up. He went on to work at the River Café as a sous chef which is where he came to the attention of the BBC. His first show was in 1999 and was called ‘The Naked Chef’. This was quickly followed by a cookbook. After numerous TV shows he launched a campaign to improve the food served in schools, encouraging them to ditch junk food. 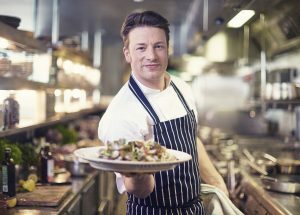 His first high-end restaurant was Jamie’s Italian, and the first one launched in 2008. Gordon Ramsay was born in 1966 and over the years his restaurants have earned no less than 16 Michelin stars in total. Restaurant Gordon Ramsay is the signature restaurant and it is located in London’s Chelsea area. This restaurant alone has three Michelin stars. He has made a name for himself as he has a quick temper, which TV audiences find very entertaining. He has often taken part in reality TV shows both in the UK and the US including Hell’s Kitchen and Kitchen Nightmares and he is listed as one of the highest paid celebrities in the world. He became a chef after enrolling at catering college and his first job was at the Wroxton House Hotel where he was employed as a commis chef. A series of short-term jobs followed before he went on to work at Harveys for Marco Pierre White.